There are as many reasons to order our cakes and cupcakes as there are ways to customize them. You will always find a variety of fresh baked breads, including our famous French bread – it’s perfect for po-boys. If you would like to place a special order for a cake or dessert, or schedule a wedding consultation, stop by or give us a call. Our talented bakers and decorators can make any size wedding cake. We also make groom’s cakes, bridal shower cakes and cupcakes. We bake and hand-decorate over a dozen specialty cakes every day including chocolatey Red Velvet and fresh fruit Charlottes. 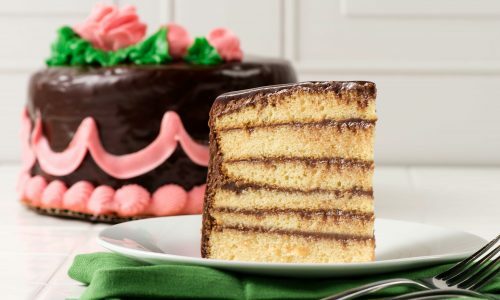 We make our New Orleans-style doberge cakes with 3 or 6 layers of fresh baked butter cake separated by a rich, pudding filling. Pictured is our 6-layer Chocolate Doberge. 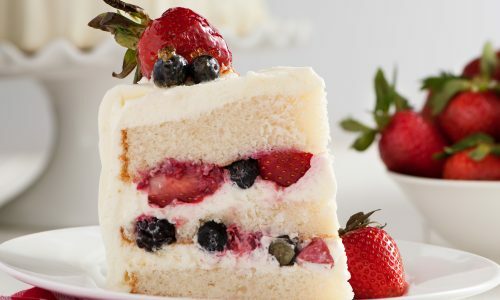 Three layers of our famous white almond cake, fresh seasonal fruit from our Produce Department, and old-fashioned icing made with real cream, real mascarpone cheese and real cream cheese. Our prize-winning white almond flavor is a favorite for sheet cakes, round cakes and cupcakes. Also available in chocolate and butter vanilla yellow with your choice of frosting. Our rich and chewy Chocolate Chip Cookie Cakes are baked fresh in store and can be decorated for any occasion. Available in regular and large. Our cupcake pull-apart cakes are great for birthday parties. Choose your favorite design, cupcake flavors and frostings. 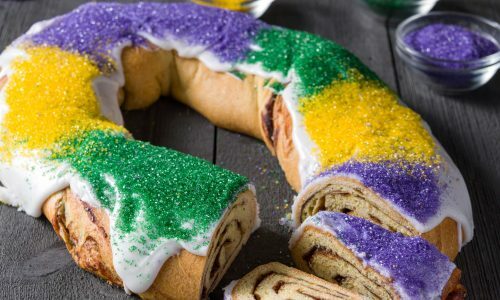 Ship Rouses King Cakes anywhere in the continental U.S.
No Mardi Gras celebration would be complete without a Rouses king cake. We bake over 500,000 of our signature sugar-dusted purple, green and gold cakes every year. Prices listed are In-Store Only.